We have set up a new themed table, that replaces the 'Golden Oldies' table we had at the clothing section for the last 2 months. For the theme of the new table we collaborated with 'Emery'. Inspired by London's late 70's/early 80's 'Glam Pop' or 'Glam Punk' style, we each picked some items of our previous releases and styled them together. We also both created some new releases, inspired by this theme. And besides these earlier and newest releases, you can find some Maitreya special editions and Emery freebies at the table. 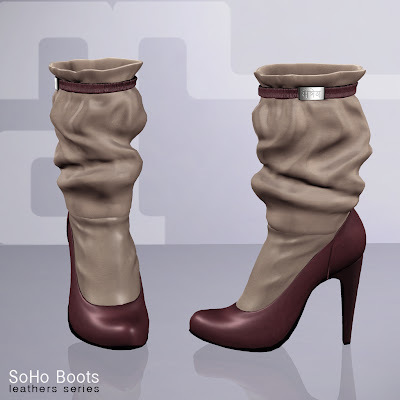 Another line of sculpted boots: Maitreya's SoHo Boots! 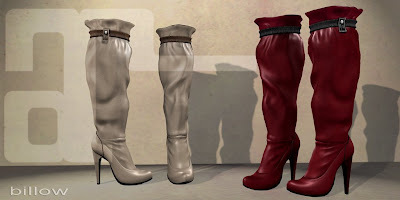 These boots look like what you would get if you would push the calf of a boot like Maitreya's Billow boots down. 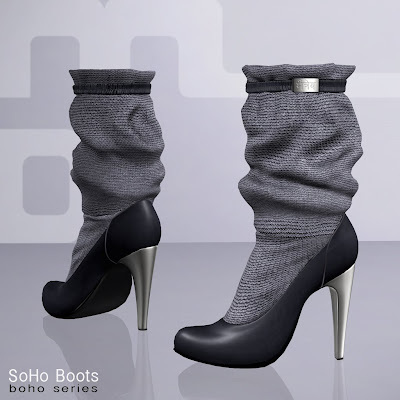 A lower, calf length boot, with deeper folds and slouches. We've created these boots in 3 different styles and each style has 5 flavours. The SoHo Boots Leathers Series are done in 2 colours, combined to create some unique shades. 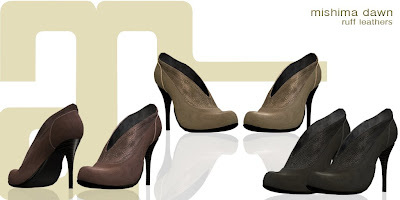 The SoHo Boots Suedes Series contain 5 different neutral tones, in a realistic colour palette. 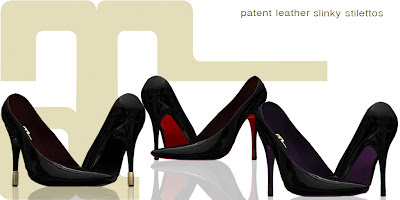 All done in a soft suede with heels made of a black wooden material. The SoHo Boots Boho Series are a combination of leather foot parts with a few different cloth materials for the calf, some of which have metal heels. The soft and flexibel character of cloth gives these boots a shabby feel. The names of the 5 different flavours in this series are all variations of the well known boho-chic look that style-icons like Kate moss, Sienna Miller and the Olson twins are known for. 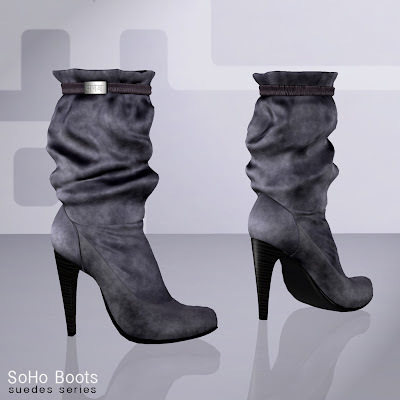 The new SoHo boots are located near the entrance and on the 1st floor of the shoes department. There is a free demo containing all colours. Due to this boots easy fit, it's a one size fits all.. but there is an extra resizable pair included too. The boots come in 3 sizes and an extra resizable pair, all included. Maitreya Isle is open to the public again with a new and more spacious build as well as some new releases. We hope you enjoy the new build as well as the new items in our store. Today's releases includes some great new accessories, patched leather caps in 8 warm colours. And our sculpted 'old leather' belts are also finally released in some beautiful muted and faded colours. We've also added 4 new hairstyles to our hair collection! To celebrate this we've also set up a table at our clothing department, with some "Maitreya Golden Oldies". You will find some of our very first group gifts and releases there. At the shoes department (right after entering it from the hall side) we are having a 50% off sale for a part of the Mishima Dawn collection. These particular colours and textures will be discontinued after the sale! We will be releasing five new hairstyles that will only be for sale at the hair fair until after the 7th of september (after that we will add the styles to our hair collection at the mainstore). There has been a lot of confusion about our Maitreya Update Group today. We've received many IM's from group members thinking they got kicked out of the group over something they did wrong. You've done nothing wrong, we're simply utilizing a simpler way to get updates to you without spam. If you were a member of the old Maitreya Update group, you have automatically been added to the new Subscribe-o-Matic Maitreya update group. We did announce this transition a few days ago, but apparently those messages were overlooked or perhaps never came through for many people. 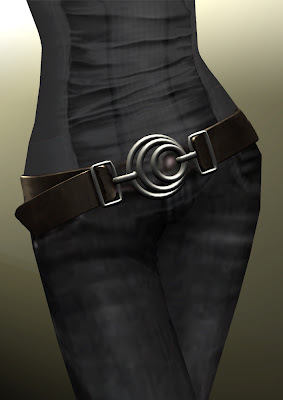 We have already sent our first notice in the new group, earlier today, with a little gift: a sculpted leather belt. We have added two hairstyles to the hair collection: Amy and Mica 2008. 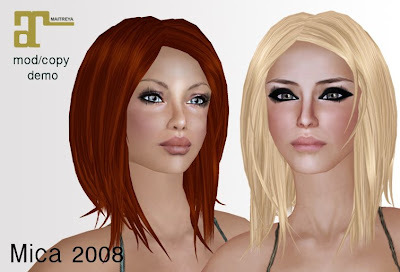 Mica 2008 is the retextured, but also revamped version of the older Mica style. And Amy is a new style that derived from it after adding bangs and playing around with it a little bit. 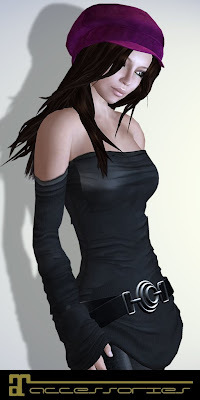 The retextured Aimee hair is the new Maitreya Freebie! You can find the free fatpack at the hair department or in the hall. The first collection of M•A•ii•K•I is all about Poofs and Puffs. 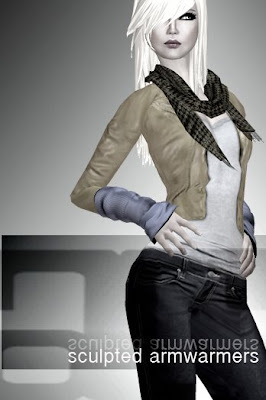 A combination of handdrawn textures and 3D rendered sculpts, create some unique additions to your SL™ fashion wardrobe. High quality clothes for fashionloving females! We have released a bunch of male and female modelposes These were created over the last 3 to 4 months, and in most cases used for our own ads and campaign pictures. 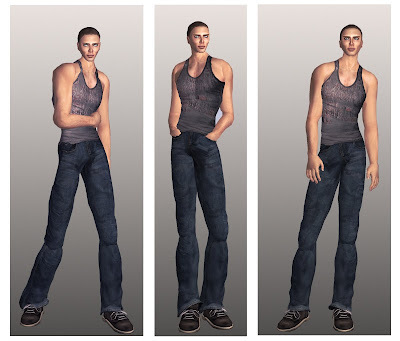 There is a male and a female modelposes set, each containing 16 high fashion poses. And there is a pack of 12 editorial female sitposes. All poses are for sale as separates too. Named after a rare orchid: Mishima Dawn, our latest sculpted ankle boots. The initial idea was to make a revamped version of the limelight ankle boots. But one thing led to another and the outcome was a complete new design, which of course deserved a bunch of new textures too. Instead of making tons of colours, we decided to create a few different materials for these ankle boots. The result is a total of 25 flavours to choose from. There are the basic leathers with suede tops, that come in 7 colours. A variation on these are the 7 'ruff leathers', with a sparkly kind of rougher leather top. 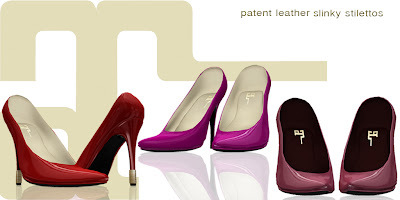 Last but not least is the series of patent and highly shiny leathers, in different combinations. The (free) demo at our mainstore contains all colours and materials, so take your time to examine them all and see which one(s) work best for you. Of course there are also fatpacks available: a leathers pack of 7, a ruff leathers pack of 7 and a patents & shines pack of 11. They are finally out: the ChiChi pumps in Velvets! There are 8 colours (Cherry blossom, Cerise, Lavender blush, Green, Amethyst, Black, Brown and Golden) and ofcourse a fatpack option. The trims for the velvet ChiChis are scripted for 21 colour options. The shoes are also for sale on OnRez if you want to give them to someone or if you just feel like lagfree shopping. I've also layed a final hand to the sculpted slouch socks. These socks were shown on the Slinky stilettos poster and many people asked about them since. I wanted to make some adjustments before releasing them and well... I can be rather slow with these things. But they have improved and they are out now in 19 colours! We wanted to do something nice for members of the maitreya update group, and decided to introduce ramdom gifts on release days. From now on we will pick 3 names of groupmembers every time we have a new release and send the winners a gift. 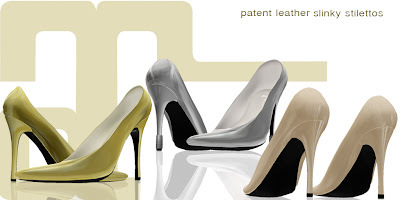 We started with this today and the winners have received a fatpack of the ChiChi pumps in velvets, congratulations!! They're out at last! We've been sitting on them for weeks, but we really wanted to redesign our shoe department before releasing them. 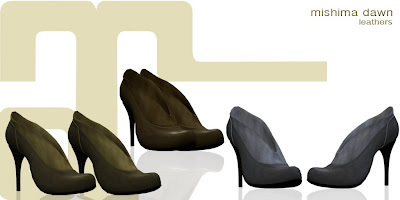 It's a round toe, platformed stiletto pump in soft suede textures. 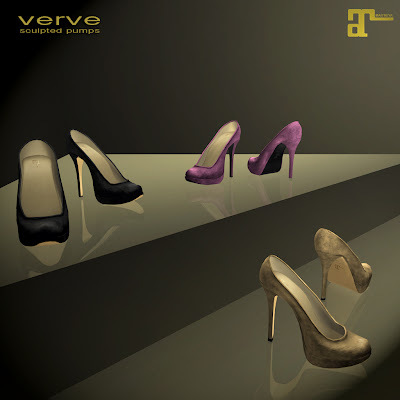 The shape derived from the ChiChi pumps, but with Verve we tried to make more of a basic pump. 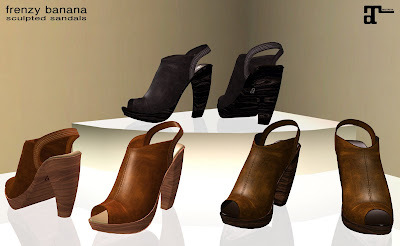 It was something we wanted to make for a long time already: a round toed suede pump, because you don't find a lot of them in sl (I think). They come with a tan and a black coloured sole. 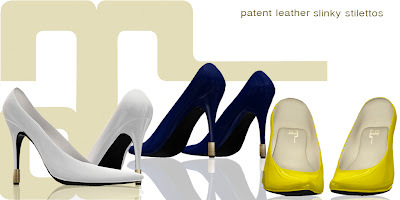 We also released 9 new bright colours of the slinky stilettos, in patent leather. So 9 warm coloured soft suede platform pumps 'Verve', 9 new vibrant colours for the slinky stilettos and an all new look for the store, yay!! These sculpted ankle adornments come in detailed leather cloth textures. They will be a great accessory for your entire shoe collection. There are 10 colours available and each colourpack has 2 colour versions for the little bows included.